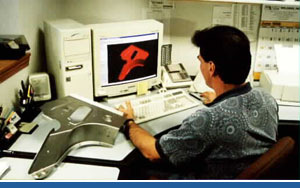 The Falcon Industry engineering department provides full service tool design and engineering services for our customers. Our accomplished team of Tool Designers and Engineers have over sixty years of experience designing progressive and line dies for steel, aluminum and plastic parts. Our state of the art facility utilizes CAD/CAM software (UGS NX, Surfcam, FastBlank, AutoCad, Virtual Dmis) to interface with our customers, manufacture die components and inspect the high quality parts they produce. Data may be exchanged with our Engineering department through the internet or removable media. Copyright 2007 Falcon Industry Inc.